On 6th September 2004, Oasis release Definitely Maybe – The DVD to commemorate the ten-year anniversary of this landmark album’s release. Celebrated as the best British album ever by Q Magazine in June 2004, Definitely Maybe became the fastest selling debut album ever upon its release in August 1994. For the first time ever, the whole album, including rare vinyl-only track ‘Sad Song’, is available on DVD. 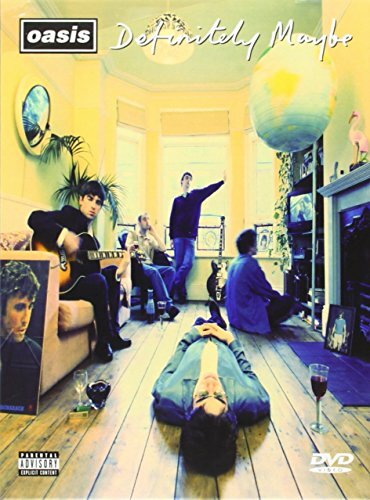 The classic audio version is accompanied by an hour-long documentary about the recording of the album featuring rare and contemporary interviews with the band, label, friends and entourage, memorable live and TV performances of Definitely Maybe’s twelve era-defining tracks and more besides – totalling nearly five hours of classic Oasis music and footage. Definitely Maybe – The DVD includes the band’s promo videos for ‘Supersonic’, ‘Shakermaker’, ‘Live Forever’ ‘Rock ‘n’ Roll Star’ and ‘Cigarettes And Alcohol’ (uncensored), some with director commentaries. Also included are the US videos for ‘Live Forever’ and ‘Supersonic’. (Oasis 2000 – ), Andy Bell (Oasis 2000 – ), Burt Bacharach, Mani (The Stone Roses/Primal Scream). Archive photographs supplied by: Paul Slattery, Tom Sheehan, James Fry, Jill Furmanovsky, Kevin Cummins, Norman Watson, Dennis Morris, Gered Mankowitz, Barry Marsden. Hidden extras include a segment from the seminal Wibbling Rivalry Fierce Panda interview release and various non-documentary strands (including a letter from Guigsy), as well as other… hidden extras. A bonus disc (only available until the end of 2004) includes further interviews and live performance footage. Oasis headlined Glastonbury 2004. They are currently in the studio recording their sixth studio album.